Does the name Todd Duffey ring a bell? Well, “Brian” as he is known to all of us who live in PR cube farms, isn’t collecting the checks like he used to do, so he considered another way to make a quick buck. So, he sued 20th Century Fox. Wait, what? As with most classic movies, film production companies want to keep the cash cow right on mooing. So, they come out with different versions of the same film that includes a few more hours of footage that never made the original. Anywho, Duffey sued his former employer for “damages, attorney’s fees, and destruction of the allegedly illegal flair that featured his likeness,” according to Uproxx.com. Unfortunately for Duffey, when he agreed to his “Office Space” role, he signed a “Day Player Agreement” with the movie’s production company, which granted the firm “all rights throughout the universe” (yes, that is the legal usage) to his performance, “including the right to use pictures from his performance for commercial purposes,” U.S. district court judge J. Paul Oetken wrote in a decision issued on March 27. 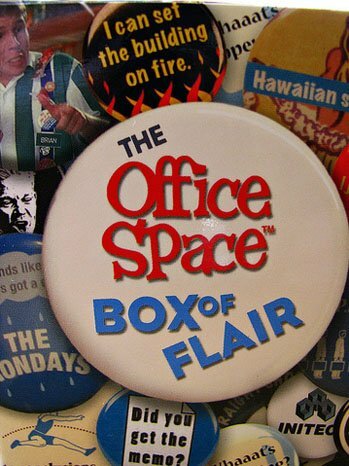 “There is only one reasonable way to read the relevant terms: Duffey granted Cubicle all rights to 17 images of his performance in Office Space, including the right to use his image on Office Space merchandise,” the judge concluded, dismissing the lawsuit.